Above map provides an overview of groundbased tracking stations in the ESA ESTRACK and the US AFSCN network that are near or on the final trajectory of UARS. For relevant trackings tations, times of Advance of Sight (AOS) or Loss of Sight (LOS) are indicated. UARS is depicted at the point of reentry (see previous post) as indicated by SSC. From the NASA talk by Johnson, they pinpointed the 04:00 +/- 1 minute UTC time and 14.1 S, 170.2 W location of UARS's demise using detections and non-detections by "a number of sensors". As can be seen on the map, none of the regular tracking stations had direct coverage of the reported reentry location, begging the question where the "large number of detections" NASA's Johnson was talking about comes from. UARS could first have shown up at the Kaena Point tracking facility in Hawaii at 4:07 UTC. At that time, it would have been without groundbased tracking for quite some time already (over half an orbit). Of course, we cannot exclude that a temporary tracking facility (e.g. an AEGIS ship) was employed in Polynesia at the time, providing additional data. Also, a reader of this blog wrote to me with the suggestion that the US Navy's sensitive network of hydrophones could have picked up a signal when wreckage hit sea surface. I have no idea how feasible that is. I still feel space-based observations were possibly involved (see my earlier post here), but are not being publicly acknowledged. 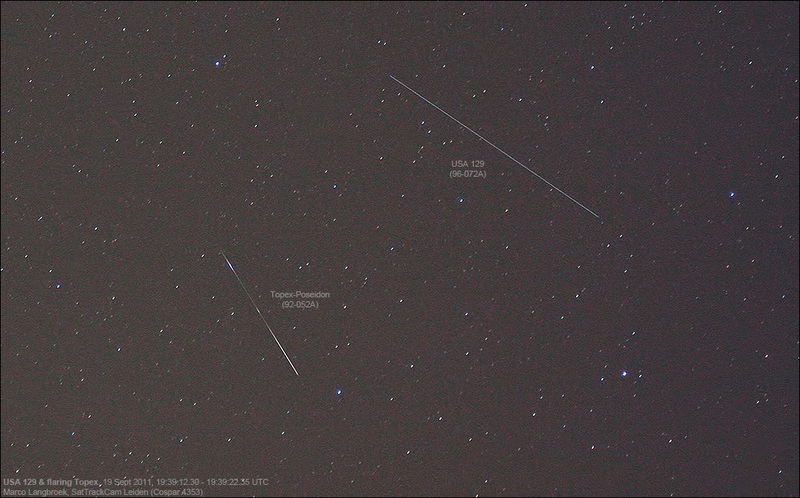 The early warning satellites DSP F20, DSP F16 and SBIRS Geo-1 would have had coverage of the reentry location. Dan Fischer raised the option in the comments that Infrasound detections could be involved. Indeed, this is a possibility (I consulted a Dutch infrasound researcher for an opinion here, and he thinks it is feasible, especially if sonic booms were involved) even though the distances to infrasound arrays involved are large. A number of infrasound arrays are scattered over the Pacific area, listening for possible atomic detonations in breach of the Nuclear Test Ban treaty. A map of them can be found here. In the wider area, such arrays are located on Tahiti (French Polynesia), Hawaii, the Marquesas and New Caledonia. The UARS reentry location is within this triangular area. Below is a map of infrasound detection arrays located in the Pacific around the published UARS reentry location. Edit late 29 Sept: Dutch infrasound researcher Läslo Evers just notified me he has checked the Tahiti and New Caledonia infrasound records for the reentry - he finds no sign of it. USSTRATCOM, followed later today by NASA, has released a new reentry time and location estimate for UARS. It puts the time at 04:00 +/- 1 minute UTC and location at 14.1 deg South, 170.2 degrees W. This is over the south-central Pacific, in the vicinity of Samoa. The time and location is said to be based on a number of detections and non-detections of several "sensors", without clear indication whether these are groundbased or space based sensors (see my previous post here) but I do suspect the latter are involved. 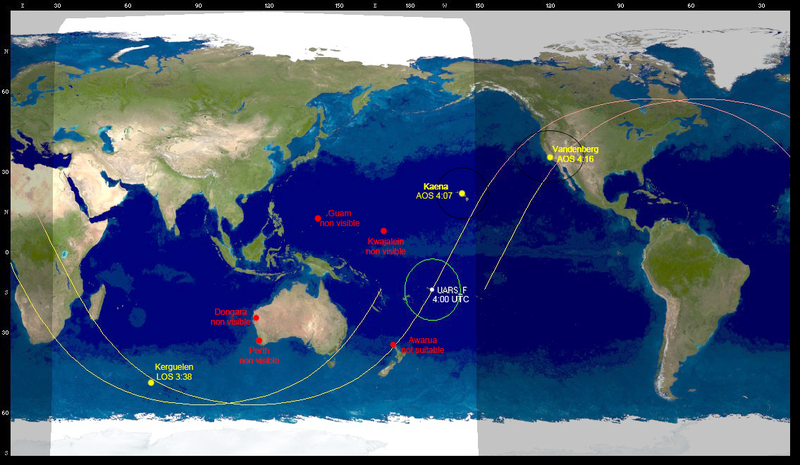 The more so since the only ground-based tracking stations in this wide area are on Oahu (Hawaii), Kwajalein and Guam, and none of these would be able to pinpoint this location so exactly as this location is out of their detection range [edit 28 Sep: plus, the final UARS track did not bring it in reach of Guam and Kwajalein anyway]. The description by NASA's Johnson in the video appears deliberately vague to me. [edit 28 Sep: there is of course always the possibility that they happened to have a tracking ship in the vicinity]. 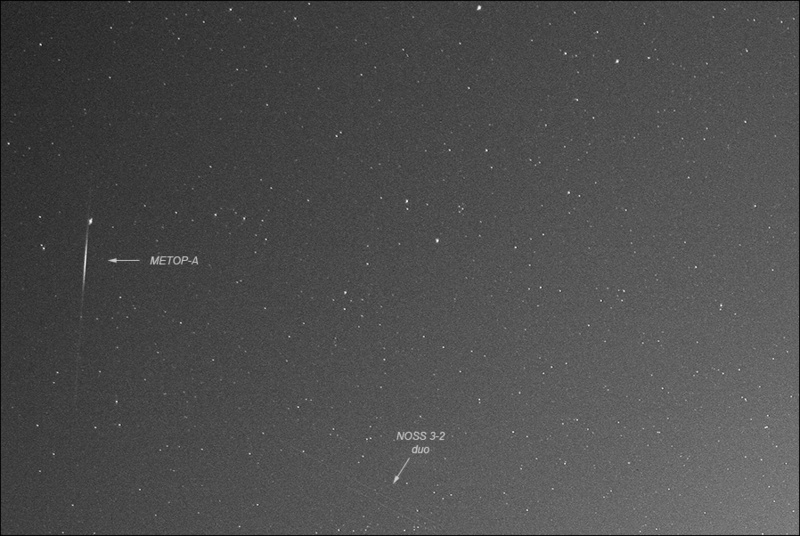 I have some lingering concern in the back of my mind about the "neatness" of a reentry at exactly 4:00 UTC (nice and round), but sometimes such coincidences do happen. Below is a map of the now released reentry point. Could the reentry of UARS have been monitored from Space? 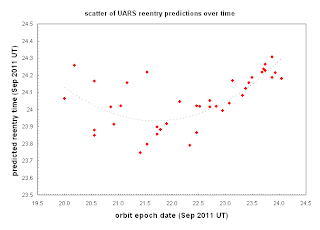 One of the open questions regarding the inability to pinpoint the exact location and time of the UARS reentry, is whether the US military might have space-based detections from their infra-red early warning satellites. The US military operates two constellations of such satellites, whose purpose is to detect and provide early warning for enemy ICBM launches using infra-red detection sensors. The older constellation is the DSP (Defense Support Program) series of satellites in geostationary orbit. 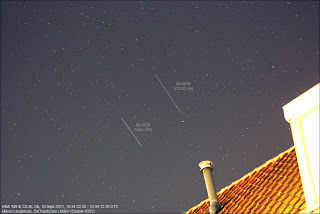 There is also the newer SBIRS (Space-Based Infrared System) constellation, consisting of one geostationary satellite (SBIRS Geo-1) and two SBIRS sensors piggybacked on HEO satellites (USA 184 and USA 200). 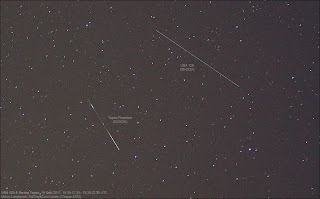 We know that the DSP satellites have, in the past, frequently observed meteoric fireballs. It is therefore widely believed (and indeed likely) that the system should have been able to detect the UARS reentry fireballs as well. The problem is that post-9/11 the DoD has stopped declassifying meteor detections (which were previously shared with meteor scientists). Which makes you wonder whether, if they did detect the UARS reentry fireball, they would be forthcoming with that information. Probably not. 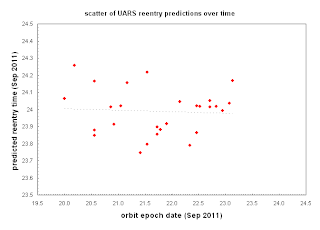 Would the UARS reentry have been visible from one of the DSP or SBIRS satellites? Would they cover the relevant areas? Yes they would. 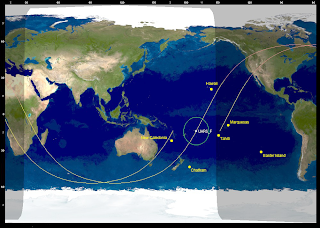 Below map shows the location (for 4:16 UTC [edit 28 Sep: this was written before the reentry time was revised to 4:00 UTC, see here]) of UARS plus it's track, and the locations of the relevant satellites. Yellow dots are the block 5 DSP satellites, white dots the SBIRS satellites. The green circle outlines show the coverage area of DSP F16, DSP F20, and SBIRS Geo-1. The DSP's and SBIRS GEO-1 are geostationary and hence always above the geographic spot depicted in the map (with some minor latitudinal variation): for the HEO SBIRS platforms USA 184 and USA 200 the position plotted is for 4:16 UTC.At that time USA 184 was near apogee and basically almost in the same position (in geographic subsatellite point terms) for an hour on each side of 4:16 UTC. USA 200 was moving towards perigee, but would have UARS in view during the whole Africa pass of the latter. DSP F16, DSP F20, SBIRS GEO-1 over the eastern Pacific as well as the SBIRS platform USA 184 over Siberia would cover the approach track over the Pacific and nominal center of the reentry window of UARS. Basically, they cover UARS on it's final track from New Zealand to over Canada. Beyond Canada (would UARS have survived well beyond 4:16 UTC), DSP F17 over Brasil and the SBIRS platform USA 200 moving over Africa would have taken over, joined by DSP F18 plus DSP F21 and DSP F22 (all over Africa or the Indian Ocean) once over Africa. I also checked whether the experimental satellites in the STSS (Space Tracking and Surveillance System) series would have been able to capture it: turns out they would not have, as these satellites (in low earth orbits) were not near the relevant part of the UARS track at that time. 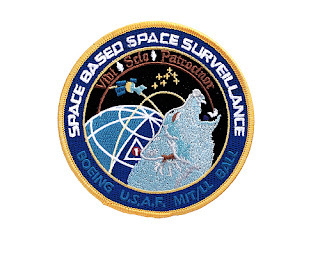 In conclusion: there is plenty of possibilities for the US military to have detected the UARS reentry from space, using their space-based assets (DSP and SBIRS) in GEO and HEO. 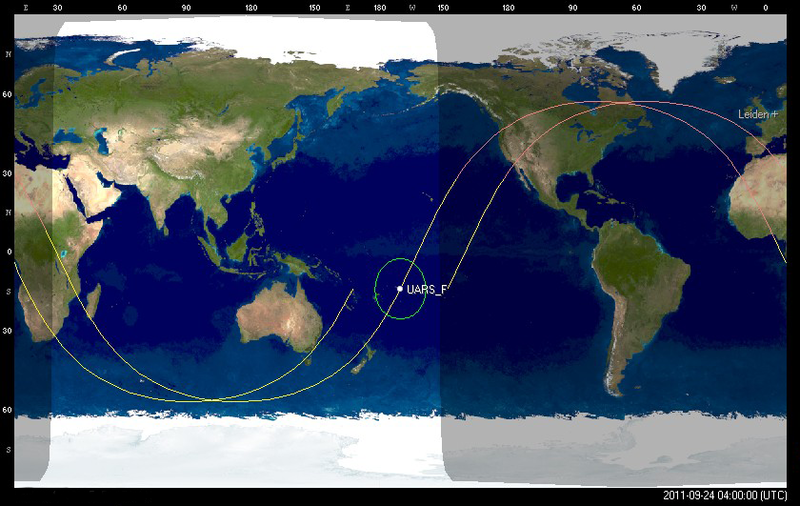 Even if groundbased tracking facilities were sparse over UARS' final track, the space-based sensors should have been able to observe and pinpoint the reentry. Yet, I suspect that if these observations exist (allowing the DoD a clear indication as to where UARS debris might have showered down), this information will not be released to the public. 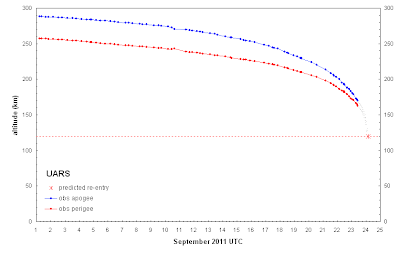 We are now probably less than 3 hours from UARS reentry. Watched the 01:37 UTC pass here: this UARS pass was with the satellite completely in earth shadow. Nothing was seen, which means it is not glowing yet. 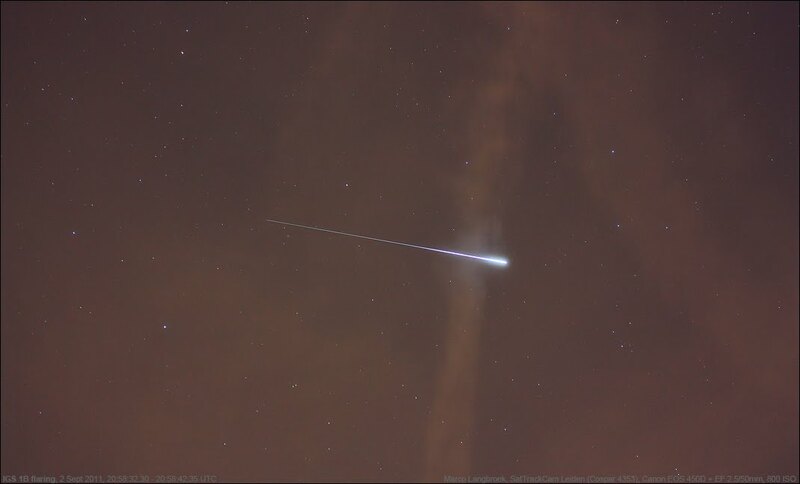 To make up for missing the decay (this was the last realisticly visible UARS pass for me in the Netherlands), I was treated on a beautiful meteoric fireball at 01:32:44 UTC, at least magnitude -5 if not brighter, appearing due south. 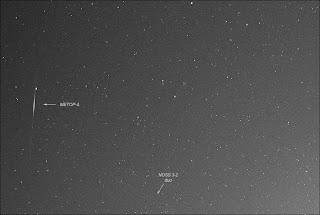 It moved through Cetus ending some 10-15 degrees above the horizon. Mediumfast, and with a wake. 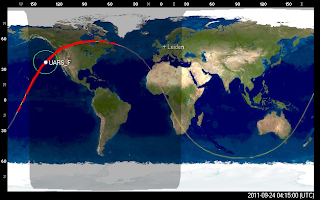 This is probably my last pre-reentry UARS update: I am very tired (it is 4:15 am here), the show is over as far as the Netherlands is concerned, so I am going to bed and will see tomorrow morning where UARS came down. 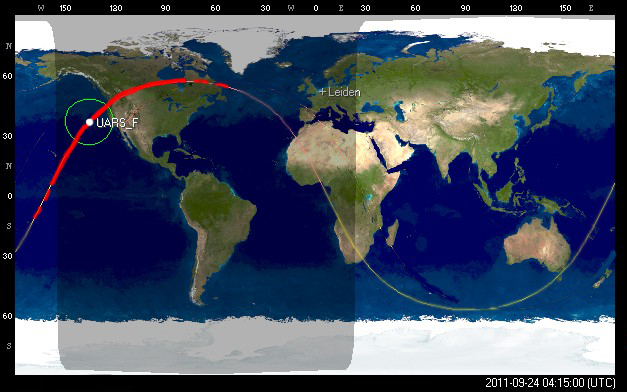 SatEvo software with the latest orbital elements projects the re-entry at nominally 5:25 UTC (24th), so the time is slightly moving away again from 6+ UTC towards an earlier time. Harro Zimmer predicts, using a more sophisticated model, 4:15 UTC +/- 90 minutes. I covered the 21:05 UTC pass here, maximum altitude 57 degrees. It was a pass completely is shadow, so UARS would only be visible if it was already developing plasma phenomena. I did not see it (using both camera, and visually wityh 10 x 50 binoculars) so it isn't glowing yet. SatEvo software with the latest orbital elements now suggests re-entry at about 5-6 UTC (24th). 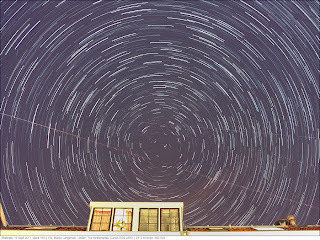 Harro Zimmer, using a much more sophisticated model, suggests 3:45 UTC, +/- 90 minutes. The nominal projected times for the UARS decay are moving forward again, to later times (which is less favourable for Europe). 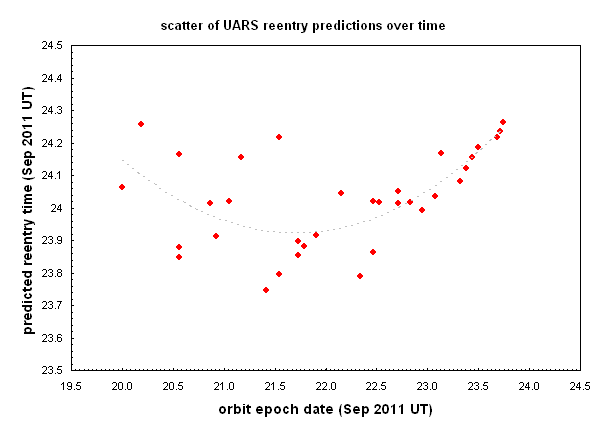 The latest three orbits at the moment of writing suggest times between 2 UT and 3:45 UT on the 24th. !FDC 1/2095 FDC .. SPECIAL NOTICE .. EFFECTIVE IMMEDIATELY UNTIL 1109252359 UTC. 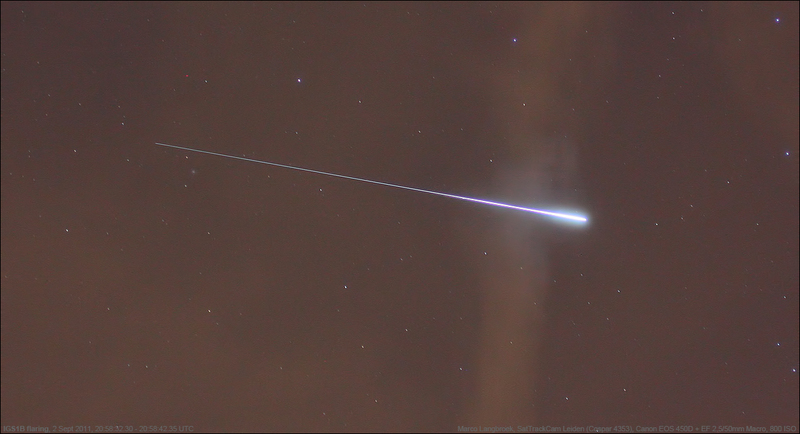 AIRCRAFT ARE ADVISED THAT A POTENTIAL HAZARD MAY OCCUR DUE TO REENTRY OF SATELLITE UARS INTO THE EARTH'S ATMOSPHERE. FURTHER NOTAMS WILL BE ISSUED IF SPECIFIC INFORMATION BECOMES AVAILABLE. IN THE INTEREST OF FLIGHT SAFETY, IT IS CRITICAL THAT ALL PILOTS/FLIGHT CREW MEMBERS REPORT ANY OBSERVED FALLING SPACE DEBRIS TO THE APPROPRIATE ATC FACILITY AND INCLUDE POSITION, ALTITUDE, TIME, AND DIRECTION OF DEBRIS OBSERVED. THE DOMESTIC EVENTS NETWORK /DEN/ TELEPHONE 202-493-5107, IS THE FAA COORDINATION FACILITY. 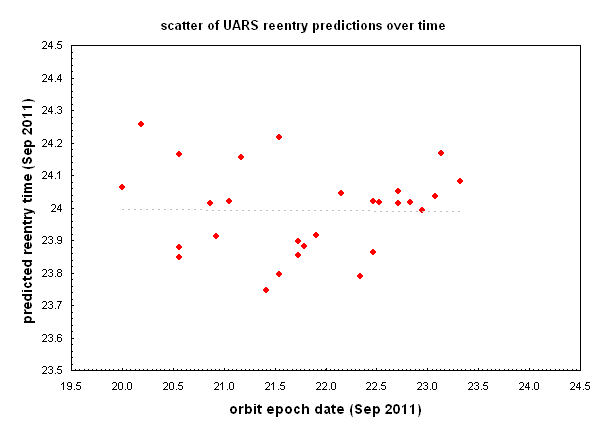 The projected decay time for UARS keeps shifting back and forth with each orbital update. Over the course of today, it has oscilated between 19:00 UT on the 23rd to 01:00 UT on the 24th. The last few orbits tend to favour the later part of this time window, but it could as easily swing back to the earlier part of the window again over the course of tonight and tomorrow. This just goes to show that the uncertainties are still large and still amount to many hours. Over the course of tomorrow, it will become gradually more clear. The current time window is however exciting, as we have passes visible from Europe including the Netherlands during that time span, notably around 21h UT. Re-entry of UARS is now projected on the 23rd. Latest orbit plus current solar flux and Alan Pickup's fine SatEvo software suggest a nominal time near 19:00 UTC on the 23rd, but at this time that still has an uncertainty of several hours (I suggest up to at least 6 hours). Areas with the best chances to see the reentry are currently for a swat that includes South-America, Europe, Russia, central Asia, southeast Asia and Australia, which all have passes in the hours around the nominal predicted time. It is increasingly unlikely that the USA will get to see anything of it. Monday evening was clear. I targetted the KH-12 Keyhole USA 129 - it is expected to manoeuvre one of these days. While watching it (and photographing it), a bright mag. 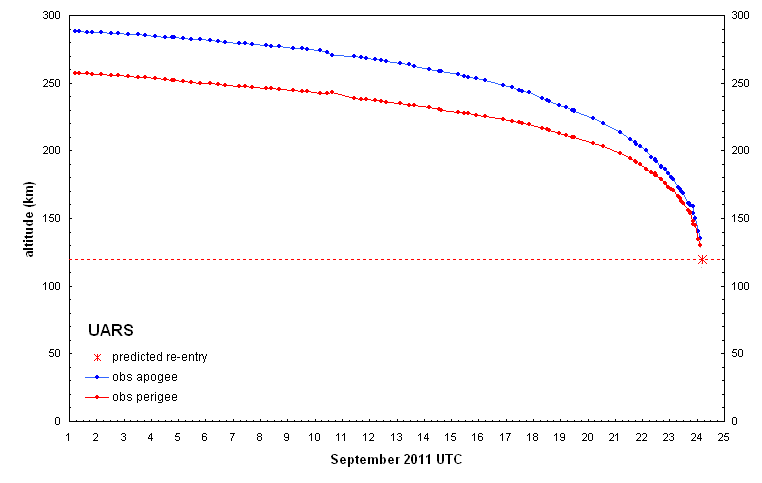 +0.5 flash occurred close to it, followed by another one and than a longer +1.5 flare. It turned out to be the malfunctioned US-French Oceanographic satellite Topex/Poseidon (92-052A), which I have observed flashing before. It malfunctioned in 2006 and since has started to tumble. Note: forecast and diagram now superceded by update here. All eyes of the satellite world are now firmly on UARS. Unfortunately, I have no visible passes here these last few days of its existence. The predictions for the moment of re-entry keep fluctuating between late September 23 and early September 24. 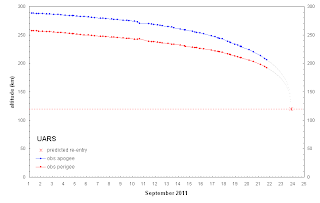 Using Alan Pickup's SatEvo software and a 10.7 cm solar flux value of 145 plus this morning's latest elset, the nominal prediction is for the early hours of September 24 but this time still has an uncertainty of up to half a day. Below diagram shows the changes in apogee altitudes (blue) and perigee altitudes (red) of UARS over September, plus a forecast of the future evolution of them (grey) untill re-entry. UARS update: It seems that the re-entry moment for UARS, the defunct NASA Upper Atmosphere Research Satellite, is moving forward in time, as Harro Zimmer pointed out on the Seesat-L list. NASA and SSC Space-Track both settle for a decay on or near 24 September, and so do independant analysis by Harro Zimmer as well as my own assessment (using Alan Pickup's SatEvo software with current 10.7cm flux values). As the orbital development near decay is highly influenced by solar activity, there currently is an uncertainty of possibly up to a few days in these predictions. Yet it seems save to say that UARS has not much more than a week left. Nanosail-D update: Meanwhile, that other NASA object up there slowly coming down, NASA's experimental solar sail Nanosail-D, seems not quite willing to give up. It's current orbit and current values for 10.7cm solar flux suggest it will hang on at least another month, untill late October. Same caveats as for UARS apply. 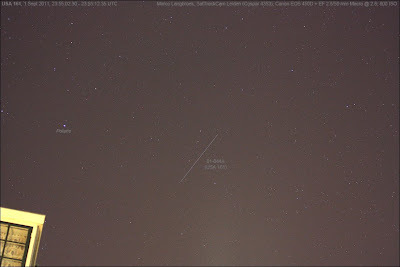 IGS 1B update: this defunct Japanese spy satellite which is steadily coming down (see earlier post here and earlier posts linked their in) since it malfunctioned in 2007, likewise seems intend on spending some more time up there. The current orbit plus solar activity now give a nominal re-entry prognosis for early 2013 instead of 2012. This date is certainly still going to shift back or forth considerably however, depending on how solar activity develops. A brilliant fireball was seen and filmed over the US southwest (Arizona, Nevada and California) last night. Some media suggest it could be connected to UARS, the US satellite about to plunge down in the atmosphere later this month. It was definitely not UARS though. 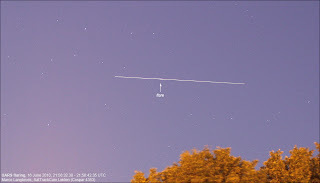 Not only was UARS still being tracked and hence in orbit after the fireball appeared (approx. 19:45 MST on the 14th, or 2:45 UTC on the 15th): but it was simply not passing over that part of the USA at that time. It was hence not UARS, or a piece of UARS. The saga earlier covered here and here is finally coming to an end: it seems that the KH-12 keyhole USA 161 now no longer is escaping our detection. The reboost on August 24 has provided our observer's and analysts corps with quite a challenge. 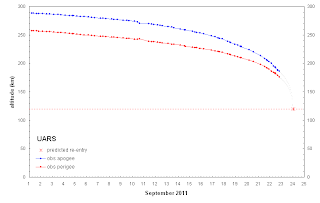 After initial failures to recover it, the satellite was detected by several observers (including me) for a number of times in the early days of September. But in each case it was subsequently lost again and each new preliminary orbit solution put forward seemed to be wrong (see the two posts linked above in the introduction). Analysts were in despair, and observers confused. Then Ted finally found a solution which seemed to agree with all observations and asked observers to search according to this search orbit early this week. Following this, Scott Tilley in the USA indeed recovered the object in a position much as predicted by Ted's solution, with Russell Eberst in Scotland following suit. The now established orbit is quite different from the earlier search orbits. Instead of the perigee having been raised, it turns out that it has been lowered, with the perigee 40 km lower and apogee 120 km lowered. I am giving Twitter a try - I know, I am late to jump on this bandwagon, but what with this observing blog and Facebook and all, it is already enough thin gs to update. Anyway, click on the small blue button with twitter logo in the top of the sidebar if you are interested in my tweets. 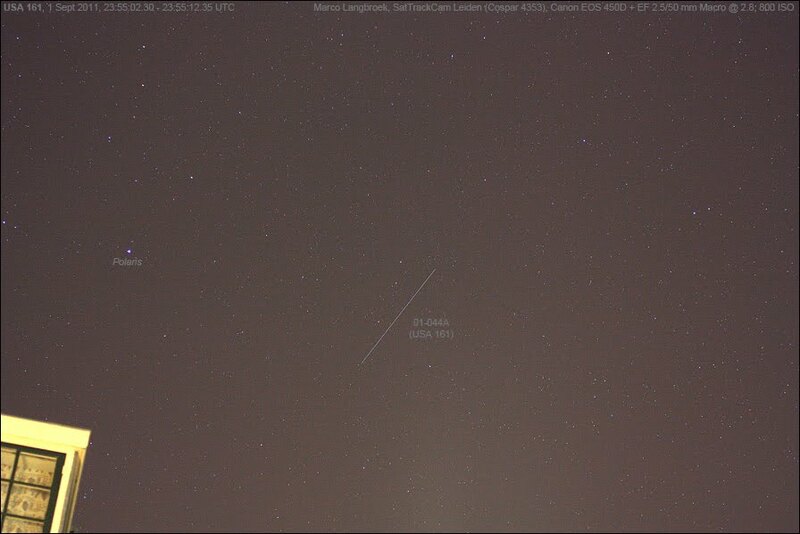 They will not all be about satellites though, and some might occasionally be in Dutch. The attention to the hunt for USA 161 means I have a backlog of other objects to report. 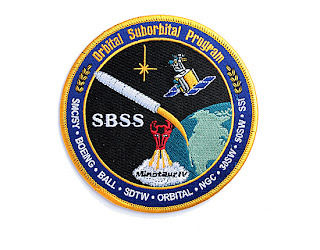 One of these is my first observation of SBSS 1 (2010-048A), the first object in the Space Based Space Surveillance (SBSS) series. 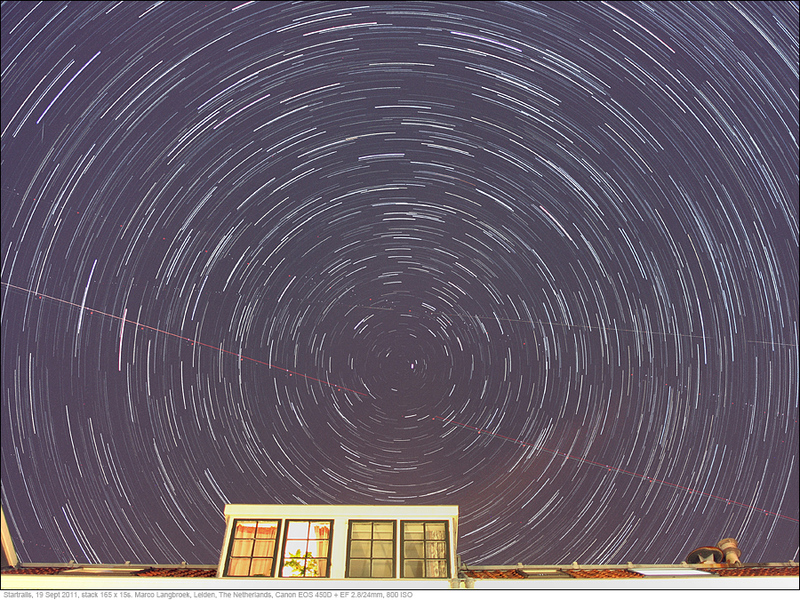 The picture above was made in the evening of September 1st, using the new Samyang 1.4/85mm lens. 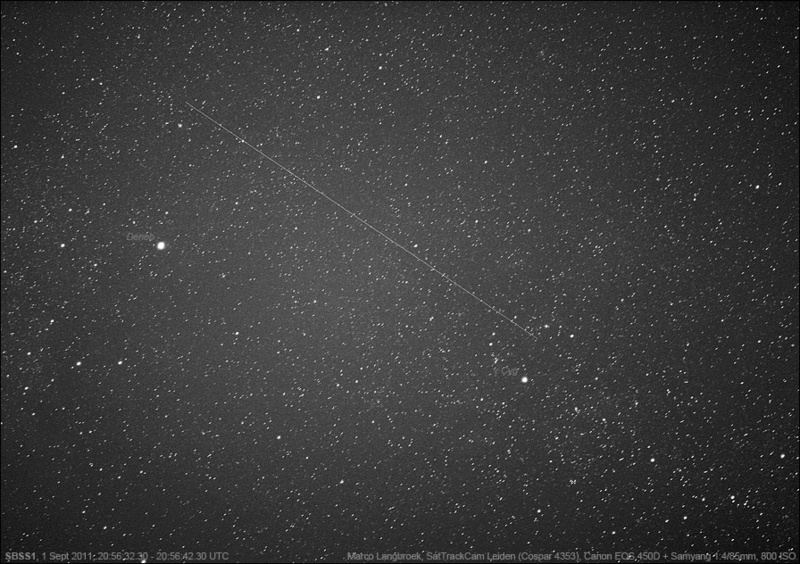 It shows SBSS 1 moving (left to right) through the northern part of Cygnus (bright star at left is Deneb). SBSS 1 is the pathfinder mission in the SBSS series and was launched a year ago on 25 September 2010. 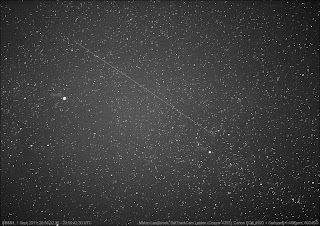 It is too faint for my 2.5/50mm lens, but the 1.4/85mm Samyang captures it well and has a FOV that is wide enough to show the full trail. The satellite consists of a 30cm telescope with a 2.4 megapixel sensor. It's purpose is to track other objects in space. A picture of it during assembly can be seen here.